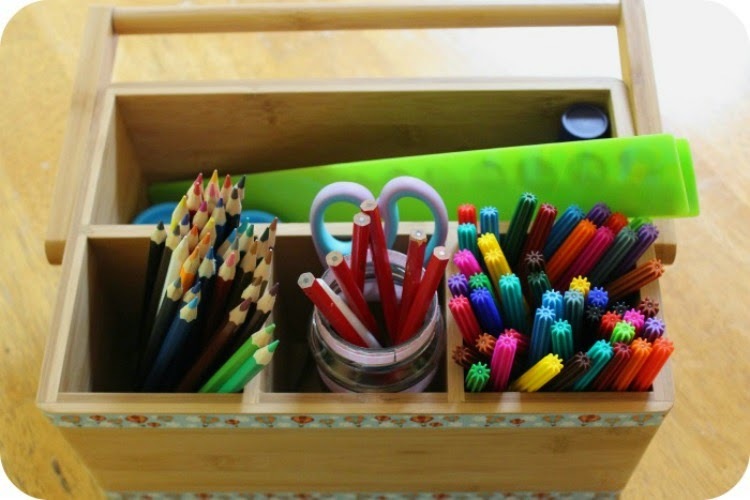 Girls Wear Blue Too: Make a Homework Caddy! 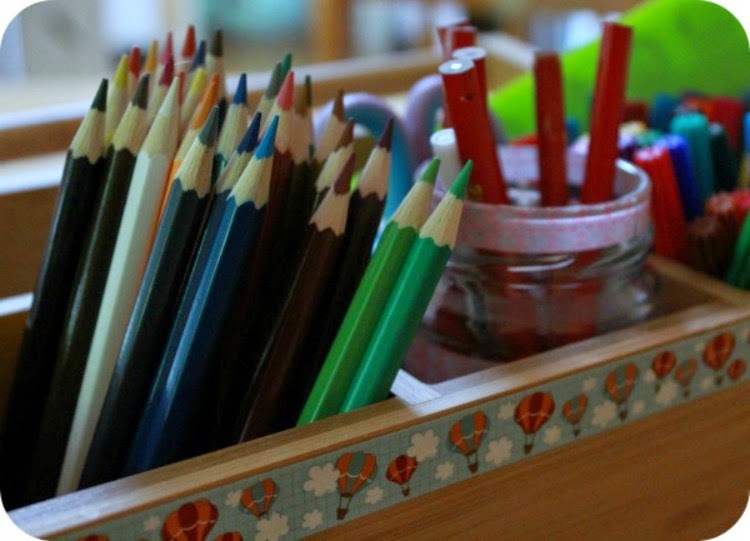 In my quest for organisation I somewhere along the line stumbled across the idea of a homework caddy. This struck a chord with me as something that might make homework more fun and eliminate any excuses not to do it at our house. My Daughter wavers in her dedication to completing homework and getting my son to do homework ... well lets just say its is not a task I have enjoyed. We will have both Children at the same School this year so their homework cycles should coincide more closely, making it easier for me to carve out a schedule for afternoons to dedicate to the tasks assigned. I got this Bamboo table caddy from Aldi last week it was $9.99 and is of solid construction, Very plain and simple I knew it would suit my purpose quite well. I spend another $10.00 on markers, pencil sharpeners, Rulers and Scissors. I already had pencils set aside that I purchased earlier in the year and some lead pencils I had already set up in a jar. My hope is that having these supplies set aside exclusively for use on homework will encourage and cultivate a nice homework culture here. I've seen caddy's made with recycled cans, cardboard boxes, plastic tubs, wicker baskets, wire baskets and goodness knows what else. I finished off our caddy by decorating it with a couple of lengths of Cute Deco tape. You can get Deco tape at a lot of the 'My Value' type stores for about $2.00 a roll. That's a good idea, Tammy. Not long before children go back to school. Only another week and a bit here in Queensland. I little longer here Chel. Ours don't go back till early Feb but the time is passing quickly.